Want results? Make every round count! Thanks to everyone who supported us by training at Round 1 last week. I have to admit – it was a little hard ‘getting going’ early in the week as so many of us came off ‘The Big Sick’ but by the end of the week things seemed finally ‘back to normal’ with busy sessions and (pretty much) everyone back to normal operating speed. What used to be TWO (2) classes – ‘Body Work’ and ‘B+ Boxing’ – have become a single, new ‘merged’ class…with TWO ‘streams’ or ‘pathways’. Some of the exercises in the class will be done by ‘everyone’ – at other times you will have a choice to make between doing a strength based activity (traditional Body Work style) or a more ‘Boxing’ oriented activity. We have been running this each night from Mon-Thurs in the 7pm timeslot for a couple of weeks now and it seems to be going well…but I don’t know what to call it. So if you have any ideas, let me know and I will update the timetable so that all the current B+/BodyWork times become this new, merged session type. Whilst I am talking ‘classes’, thanks to everyone who gave the new ‘BARBELL Club’ sessions a go last week…feedback has been great and I am excited to see where we can take this. There are 3x sessions per week at the moment (Tuesday and Thursday at 6:30pm, Saturday at 6am) and each session is unique – it isn’t a simple TANKS replacement with one class repeated all week – there are 3x different sessions. The classes are purely strength (and – as the name suggests) primarily barbell focussed. There will be a measure of conditioning in them but this is not the focus – it is a strength class. When people ask me the difference between ‘Functional Fitness’ and ‘Barbell Club’ it is pretty simple – ‘Functional’ is a traditional S+C program with strength work, core, conditioning and even traditional cardio. Barbell Club is a strength program, pure and simple. 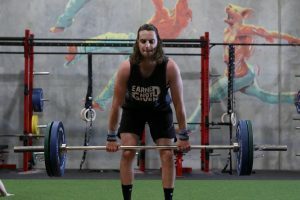 You wont come along to barbell club and find – for example – a 5km row on the whiteboard like you did in Functional a few weeks back – in ‘Barbell Club’ you will be lifting weights with the focus on getting stronger. Somehow I am 400 words in and I haven’t ‘got to the point’ yet. So here goes – on with the blog. I have had a few chats with people in the last week talking to me about the current 28-Days-Later challenge and the conversations have come back to the same point from 2-different starting points. Starting point#1 – I love these challenge extras and the ‘extra’ push I get everytime a challenge is on…I wish we could do them all the time. Starting point#2 – I am not doing the challenge this time – but could you please send me the recipes/extras so I can follow the diet/extra workouts anyway…I find they really benefit me. All of which I guess means that a lot of people find that following a ‘formal, structured, training plan’ is an awesome way to achieve great outcomes. Because it is. Setting aside the fact that if you aren’t “DOING” the challenge but still want the recipes and extras that pretty much means you ARE doing the challenge (and the 80-odd hours I spend putting it all together, creating and validating the workouts, testing the recipes, writing and pulling together the booklets should probably be worth something! )…Setting aside the fact that we created the 1%’er program to enable people to do the challenge ‘EXTRAS’ 12-months of a year…there is an easier way for almost 100% of us who train at Round 1 to get more out of the classes. IMPROVE YOUR FOCUS AND COMMITMENT ON EACH OF THE BOXING STATIONS. It really is as simple as that. Pretty much 100% of people make sure they hit their targets on the bikes, rowers, SPARCs and Skis. Pretty much 100% of people are sure to do all of their reps when it comes to barbell, kettlebell and other strength work. But we all get to the bags and treat them like rest stations too much of the time. So here goes with a few easy hints and tips to improve your work on the bags. Feet parallel is not great. Right handers have their left foot forward – with your ‘punching distance’ set so that a hard, straight left will go 1-2 INCHES into the bag. Don’t get so close that you are only throwing half-heated, half punches. And get your HANDS UP – left thumb and right thumb should BOTH be on your chin when you aren’t punching with them. I am pretty confident that everyone has – at some time – seen a boxing match of some sort. I am also pretty confident that when you watched that, the two fighters weren’t just standing on the spot swinging away (clearly watching a Rocky movie doesn’t count as watching boxing!). Move around. You need to move IN if you want to throw a hook. You need to move OUT to follow that hook with a jab or cross. You need to MOVE. If you take the ‘stand and deliver’ approach in the gym, you are only working the top half of your body…get on the move. I was told by a client a few years back that whenever I included “KO’s” – essentially our code at R1 for some freestyle boxing/bag work it is just ‘lazy programming’ on my part – and if I can’t think of a combo for them to do, how are they supposed too. 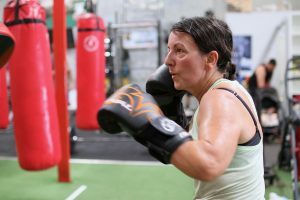 Which I guess is sort of fair – but I also know that if you are training to box, a trainer would only rarely (if EVER) tell you what combination to throw. The focus shouldn’t be on throwing the same combo as often as possible – but instead, on throwing each combination with balance and focus – strong, powerful punches. Now, I happily admit we are a fitness gym and not a boxing gym – but when you are at the bags you need to dig out your inner Lomachenko and work hard on your punching – make it fun, make it an adventure – try some different stuff…and make your mark by making each punch count. I have to admit, whenever I am doing a class I always know I am going OK if I am the LAST person to finish the assigned boxing work – it means my focus (and therefore my power) would have been nice and high…rushing through the boxing to get to the squats/burpees/fence pulls/whatevers is not what gets results – doing EVERYTHING properly is what gets results. I guess the ultimate ‘tell’ for me with regards getting the most out of your training at Round 1 is this: When people first start at the gym, the bag work efforts absolutely tax them…but over time – as they start to take these elements of our sessions ‘for granted’ and rush through them – the bags become almost ‘filler’ exercises to be done ‘in between’ the ‘REAL’ exercises. It really isn’t supposed to be this way – the sessions are planned so that the sum of the parts should be much greater than the impact of any single element of the session. If you REALLY want to move forward with your training – if you really want better results and outcomes…you probably don’t need to spend more time at the gym doing ‘EXTRAS’. What you need to do is spend every ounce that you have got when the session you are participating in is underway…keep your hands up, move your feet, hit the bags with speed and power. And have some fun with it! That’s it! See you all in the gym. 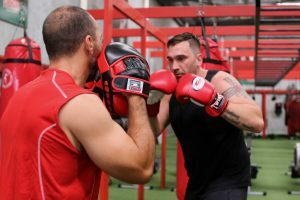 Email me (mpratt@round1fitness.com.au) if you have any comments or feedback – or especially any suggestions for the name of our new Body Work/B+ Boxing class merge!